Eating the way I have to is expensive, and I don’t have any choice but to find a way to afford it. I am financially lucky compared to many, and I still have a difficult time affording it. Over the summer as I’ve been stockpiling food for the winter, I’ve found a few ways to cut costs and thought I would pass on what I’ve learned. Ask about buying large quantities. Farmers will often cut you significant deals if you are buying a 25lb box instead of just a couple of pounds. Of course you’ll have to find ways to preserve and store that quantity. Show up late in the day for discounts on items that the farmers don’t want to pack home. Showing up late may cause you to lose out on the fast-selling items though, so be aware of that before you make this decision. Ask about the “seconds” or the “uglies.” These are items that are physically blemished but often perfectly edible. Often these are not out for display and are kept under or behind the counter somewhere. See if you can work out a trade. I have had more than one vendor tell me that if I showed up early to help them unload the truck, he’d cut me a deal on the produce I bought. I didn’t end up taking them up on it, but I don’t think they were joking. If you have a marketable skill like website design, you could look at trading that kind of work for food, as well. Keep a friendly, polite, open line of communication with your farmers. Being a good and frequent customer can get you some discounts, but if you don’t speak with your vendor enough for them to know you and remember you, they may not realize what a good customer you are. On having an “invisible” illness. Not all allergic reactions are visible. In fact the worst and most dangerous of my allergic reactions are *not* visible, because they involve the inside of my throat and mouth, my lungs, and my brain. You can’t see any of those things, but I will stop breathing all the same. Many folks I know who have life-threatening allergic reactions experience only neurological or gastrointestinal symptoms which are in fact incredibly dangerous if allowed to continue, but not in any way visible. Getting people to understand what they go through and believe that the precautions they take are necessary and not just paranoid or attention-seeking is incredibly difficult in that kind of situation. Even well-meaning and otherwise reasonable loved ones will often conclude hypochondria, except that it *isn’t* hypochondria if you are actually sick! Once upon a time, three years ago now, I had a severe and visible allergic reaction to the tiniest trace of corn derivative. It actually didn’t turn out to be that dangerous (never progressed into any internal issues), but it *could* have. At the time I took pictures because I thought it was weird and actually kind of hilarious in a sick way, but it turned out to be a very good way to get people to understand that yes, this allergy is real, and yes, it is possible to be *that* sensitive. If you or a loved one are an allergy sufferer, and have a visible reaction, I highly encourage you to document. Obviously do what you need to do to assure your safety first, but get pictures if you possibly can. It may come in handy later. When ya gotta carry an epipen, you might as well do it in style. I have a few different things I do for hauling around my Allergy Accoutrements. I keep two epipens in my bag at all times. 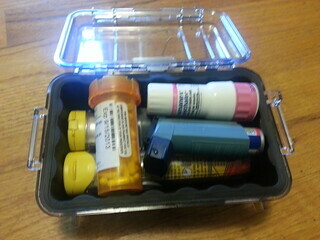 I keep them in a waterproof Pelican 1030 Micro Case along with a lip balm tin containing compounded Benadryl capsules. I taped the prescription for the benadryl to the top of the tin so that any official type person can see what the pills are. I thought keeping it in a waterproof case might be overkill, but the day after I finally got it, I had a major water bottle leak in my purse and would have lost $50 of Benadryl, if not the $250 of epipens. For longer trips, I keep two *more* epipens, plus spare inhalers, and a spare bottle of Benadryl in another, larger Pelican 1050 Micro Case . Carbon filter face mask kept in a ziploc bag, for aiborne corn: popcorn, fog machines, ethanol fumes, or people wearing a ton of perfume. A black bandana/handkerchief for wiping hands, blowing nose, whatever. If I think I’ll need it, a flattened end of a roll of toilet paper, because yes, toilet paper is often corny, and that is not a reaction you want to have. My setup is very rock and roll, but there are MANY ways to make carrying this kind of stuff around cute. There are many, many manufacturers of utility belts on Etsy and elsewhere- most of them seem to specifically mention being for Burning Man. 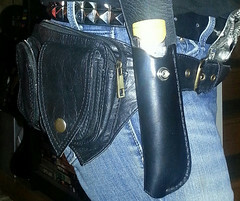 I got my utility belt from Gekko London via their Etsy Shop. The workmanship is quality, the pockets were the right size for what I needed, and bonus: The total price for the belt, including shipping to the US, was only 47 GBP! That’s a *steal* for that kind of work, I tell you! 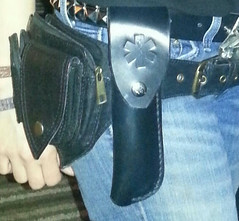 My epipen holster is also from Etsy, specifically from Dennis Doaty Leathercraft. 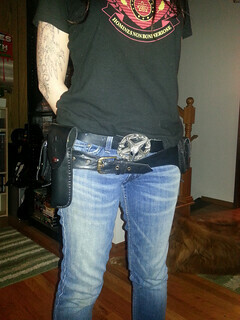 A word of caution: This holster looks badass because it looks like a weapon holster. That’s intentional. Security guards will think it is a weapon. If you are going to wear it in to an event where a weapon would be a problem, walk UP to security holding the epipen separate from the empty holster in your hand, and keep them in your hands until you are all the way through security. Otherwise you will need to tell every single security guard on your way in what it is, and some of them may actually lay hands on you to find out what it is. Can you tell I know this from experience? 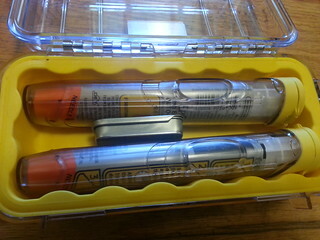 You may wish to just get a less badass looking epipen case. There are still lots of cute and less threatening-looking options out there. This started as a “note” on Facebook and sat around in draft format for months. 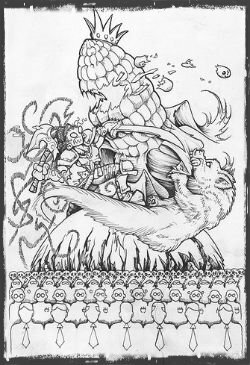 I decided to make it a blog post. Hey friends. I really appreciate the questions of concern and expressions of sympathy that I’ve gotten from people since my health took a serious dive 5 months ago, and I do not want anyone for one second to feel that their interest in my well-being is not appreciated. It most definitely is. Having this kind of intense personal disaster has really showed me how caring and wonderful people are really capable of being, and has also showed me how many of the folks I have gotten to know over the last couple of years are actually my friends, not just fair-weather acquaintances. So first, thank you SO MUCH to my friends for being awesome human beings and making me feel truly loved and like part of a community. I love you right back, and will do my level best to be there for you in the same way you’ve been there for me. Now that I’ve said that mushy stuff, I want to tell you a few things about what it’s like to be me. Some of it can be generalized to all chronic health conditions, but I don’t want to claim to speak for anyone but myself, you know? My hope in sharing this information is that you can use it to be an ally and educate others around you when you hear them being insensitive towards people with severe food allergies and other chronic and long-term health problems, and so that you can possibly avoid saying stuff that, while well-meaning and well-received when coming from you, is also the kind of thing that less awesome people say to me all of the time, and don’t mean well when they say it. This is a great question to ask of someone who has had a cold or the flu, or possibly even a surgery to repair a one-time injury. But for myself and many others, our health condition is NOT one that is going to magically go away. For some conditions, a miraculous recovery is not outside of the realm of possibility, but it’s usually extremely unlikely. While I understand that this question means that you care about how I am doing and hope that I am doing well, this particular phrasing makes it feel like you actually expect that I am going to suddenly STOP being allergic to the entire world and start having a “normal” life again. Warm fuzzy sentiments aside, there is always an undercurrent of alienation at having my situation so massively misunderstood. Unless of course I actually did just have a cold or the flu, in which case thanks for asking. Thank you for the compliment. It’s a good self-esteem boost. And I do genuinely take it as a compliment when it comes from friends. But please understand that other people have used this phrase to imply (or state outright) that because I look healthy I am healthy and should quit claiming otherwise. You can understand why it’s unpleasant to hear someone I care about utter that phrase. Actually, none of y’all have ever said this to me, and I consider that an indication of my excellent taste in friends. But, just in case it ever occurs to you to do so, please consider carefully. Eaten two foods, and only two foods, without spices or cooking oils, for weeks on end because everything else made your throat close up . Had to carefully plan your weekly shopping trips because you can only buy food you can eat from specific vendors at the weekly (or bi-weekly, for some people) farmers’ market and would literally face going hungry if you didn’t buy enough for the coming week. Had to consider carefully what to bring with you every time you leave your house because you can’t eat or drink anything that you didn’t bring yourself, not even the water. Unless you’ve been in that position (and actually a number of people I know have: it seems to be an unfortunately common experience for people with severe food allergies) then no, no you don’t know how it feels. I understand that you sympathize and that you can imagine how it feels, but no, you don’t know. This list is not exhaustive, obviously. It’s just a collection of the more outlandish changes I’ve had to make/limitations I’ve had to accept in my life due to my corn allergy. I’m not writing this up to gain sympathy, though I do spend plenty of time feeling sorry for myself. I’m just trying to give you an insight into how many basic daily tasks are affected by such a non-exotic health condition. I have trouble finding water to drink. Most brands of bottled water use vegetable (corn) fibers in the plastic bottles, and often use corn-based chemicals to disinfect the water. Even a corn-based antimicrobial agent in a water filter will leech enough corn into the water to cause me an issue. Seattle tapwater is so far safe for me, but not all tap water is depending on how it’s treated. I don’t know a lot of people with water softeners, but water softener salts also contain corn. I cannot drink *anything* from a glass or cup at a bar. Actually, I can’t drink or eat anything from the dishes in a bar or restaurant because I am allergic to the soaps and sanitizers used on the glassware, and seem to also have random problems with plastic cups, either the plastic itself or something they are dusted with. If I am at a show and need to drink water, I have to go drink from the bathroom tap,and hope that the tapwater is not treated with corn-based chemicals, which it sometimes is. The one smidgen of hope here is that if I can identify a safe pre-bottled beverage, like a cider or a gluten free beer, and found a bar that carried said beverage, I could have that. I can’t eat out at a restaurant, ever. That was covered above, but it is significant enough that I felt it deserved a bullet point. Even if they miraculously used a dish detergent that was corn-free, most cooking oils are cross-contaminated with corn, and there’s no way they could get their pans clean enough to be safe for me. Related to that, I also can’t use dishes from other peoples’ houses unless I rewash them with my own dish soap. I can’t see movies in the theater. My allergy is airborne, so places with popcorn are no good for me. While I might be able to make some arrangements to visit a theater while it is not busy and take plenty of antihistamines ahead of time, the prospect is risky and so it’s not something I can do often. I can’t eat most produce and have very few available protein sources. We’re talking whole, organic foods here. Organic produce is waxed, gassed, and sprayed with corn-based “organic” substances. Organic, pastured meat is sprayed with organic corn-based disinfectants before carving and packaging, and then placed in packages with soaker pads that are soaked in corn-based antimicrobial agents and then wrapped in plastic that is dusted with corn starch. Beans + grains would be a good option for protein, but I seem to react to those too. I haven’t yet figured out if this is a separate allergy or contamination in the fields/storage facilities/processing facilities. So no, just because it “seems” natural or organic doesn’t mean I can eat it. Going to crowded places is a health hazard for me. Cleaning products, perfumes, laundry detergent, lotions, and conditioners are all full of corn-based chemicals, even the “all natural” stuff. Going to an art gallery, a concert, or even just the grocery store usually leaves me with at least a mild headache, if not a full on hay fever-like reaction. There is a nonzero chance that in a medical emergency, health care providers will kill me while trying to save me. There is corn-derived chemical in lactated ringers solution, which is the IV fluid that hospitals give you if you are dehydrated and before a number of medical procedures, and a corn sugar (dextrose) is often added to that solution. There is also corn sugar and other corn-derived chemicals in many other injectables, and corn starches and sugars in most prescription drugs. I have never been injected with dextrose to know what would happen, but considering that my reaction to ingested dextrose is anaphylactic, I suspect an intravenous dose would be disastrous. This is probably the way my life is going to be forever. A miraculous recovery isn’t *completely* impossible, and it does sound like it has happened that people have been as sick as me and come back from it to a more reasonable level of sensitivity. But I absolutely cannot assume or plan for that being the case. So this is my life for now. The best I can hope for is to find more efficient ways to cope with the accommodations I have to make so that I can go back to focusing on living life instead of just surviving. My other hope in sharing this is that you will be understanding about the fact that I cannot seem to STFU about my allergy. Because it pervades every single aspect of my life, the topic feels relevant to most conversations. And since it’s on my mind a lot, it’s pretty hard not to talk about it, even if I don’t really want to. I often feel self-conscious about talking about it, but I can’t seem to stop myself. So if you’ve actually read to the end of this, I hope that you’ll understand why that is and have some patience with me when I go off on a tear about how corn is in absolutely everything and I can’t go anywhere or eat anything ever again.